In order to diagnose a person with multiple sclerosis (MS) and recommend the best treatment possible, a doctor must first perform a complete neurological exam. There is no one test or measure that can be used to make a MS diagnosis. Instead, the diagnosis often relies on thorough exams that rule out other conditions with similar signs and symptoms. This is also called a differential diagnosis. 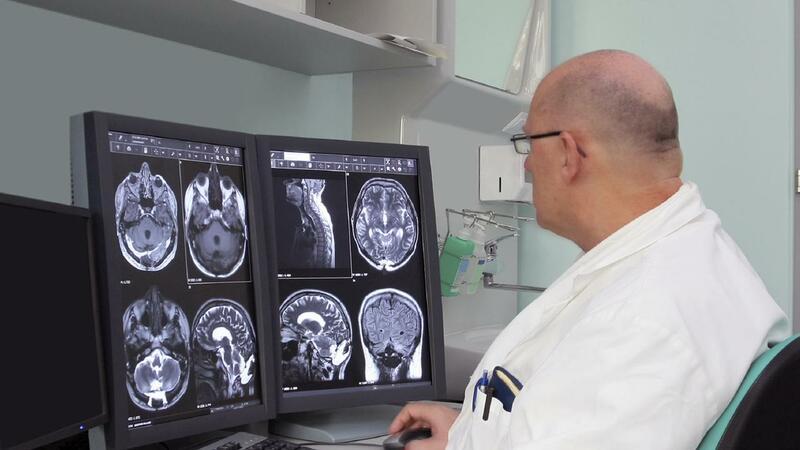 Doctors use a variety of tests to help confirm an MS diagnosis and rule out other diagnoses. When diagnosed, MS requires treatment to help decrease the signs and symptoms and increase the person’s quality of life. An MRI is commonly used to look for changes, or lesions, in the nervous system that are characteristic of this disease. MRI’s generate images of the brain and spinal cord that can show lesions in the nervous system that occur in MS. When getting an MRI, a contrast agent or special dye is injected into the veins of the patient. In patients with MS, the blood brain barrier can be disrupted and this may cause the dye to leak into the MS lesion, which is imaged by the MRI. Aside from these tests, a doctor may also recommend what are called evoked potential tests. These tests use electrodes and electrical signals to perform a series of painless tests. The electrodes are placed on the skin and an electrical current is applied, with the purpose of measuring the speed and accuracy of the stimulation response in the nervous system. A lumbar puncture can be also used when diagnosing MS. In this procedure, a doctor obtains a cerebrospinal fluid sample, which allows them to look for inflammatory cells that are commonly associated with MS. Additionally, this MS test is used to rule out diseases that are closely related to MS, such as certain infections and other illnesses. When signs of MS are found in the nervous system and all similar diagnoses have been ruled out, the doctor will diagnose the patient with MS. The course of this disease can differ in patients, which is one of the main reasons doctors find it difficult to predict and diagnose MS. If you are wondering “do I have MS?”, it’s important that you share all your symptoms and a complete medical history with your doctor. This is important to make sure they have all the information necessary to rule out other conditions. In a majority of cases, MS starts with an initial case of signs and symptoms followed by recovery. This is referred to as relapsing-remitting MS. The recovery is sometimes complete, but in many cases it can be partial. The timing of a second onset varies greatly among individuals. It may be weeks, months, or even years before the second attack occurs, after which another recovery period will typically follow. Those who are diagnosed with relapsing-remitting MS are done so in a straightforward way. The diagnosis is often based on the pattern of symptoms that are common with this disease and confirmed by MRI or similar brain scans. A doctor may also diagnosis a patient with primary-progressive MS, secondary-progressive MS, and a few other rare variants of the disease. Primary-progressive MS is characterized by gradual physical decline. There is no noticeable remission, but minor symptom relief is a possible. The most commonly affected groups are men and women over 40 years old. Both men and women are affected similarly. Secondary-progressive MS appears initially as relapsing-remitting MS, but later appears as primary-progressive MS. Patients who have had relapsing-remitting MS with severe symptoms are likely to develop this type of MS if improperly treated or not treated at all. Rare variants of MS include the Marburg variant and Balo’s concentric sclerosis. Marburg variant is a type of MS that appears quickly and often results in death within about one year of onset. Balo’s concentric sclerosis also progresses rapidly. In these cases, characteristic rings of concentric demyelination can be seen on an MRI. When it comes to diagnosing unusual symptoms of the progressive condition, extensive testing is often needed. This may include spinal fluid analysis, additional imaging, and evoked potentials. Find evidence of damage in a minimum of two central nervous system areas. These must include the brain, optic nerves, or spinal cord. Determine that the damage has been present for at least one month. Rule out every other possible diagnosis. As previously stated, there are many conditions that also result in demyelination and can be mistaken for MS. In order for a doctor to determine a proper MS diagnosis, they must rule out other possible conditions. MS is the most common condition that leads to demyelination. However, others include types of viral infections, severe vitamin B12 deficiency, high exposure to toxins, certain autoimmune conditions, and some hereditary disorders. Demyelination of the nervous system can also be a result of Guillain-Barre Syndrome. In this condition, the body’s immune system attacks the myelin sheath that surrounds the peripheral nerves. MS is a serious disease. If one is diagnosed with it, steps must be taken to treat the patient quickly and effectively. Therefore, it is of utmost importance for a doctor to make the right diagnosis and to take the measures necessary to improve a patient’s outcome.